Why might someone want to participate in a clinical trial? What are the potential benefits and risks of taking part in a clinical trial? 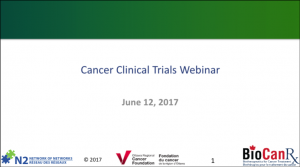 The webinar also features a section on existing resources available to the public, where people can find more information about cancer clinical trials and where to find trials. BioCanRx is a network of scientists, clinicians, cancer stakeholders, academic institutions, charities and industry partners working together to accelerate the development of innovative cancer therapeutics. BioCanRx invests in Canadian innovations, always looking for a clear path to the clinic for the benefit of patients. Through a collaborative research funding process, BioCanRx is becoming a world-leader in the translation, manufacture and adoption of innovative cancer immunotherapies and is addressing socio-economic considerations necessary for their adoption by health-care systems. BioCanRx receives funding from the federal government’s Networks of Centres of Excellence, and support from industry, provinces and many charities. For more information please visit biocanrx.com. The Network of Networks (N2) is a not-for-profit incorporated organization and an alliance of Canadian research networks and organizations working to enhance national clinical research capability and capacity. Bringing together trialists and clinical research professionals from across the country, N2 provides a common platform for sharing best practices, resources and research-related content to ensure efficient and high-quality research, integrity of clinical practices and accountability. The organization is truly representative of clinical research in Canada and acts as a national voice and advocate on behalf of a broad range of stakeholders that have an impact on the efficiency and quality of clinical trials conducted in Canada. N2 has created a unique environment for clinical researchers to benefit from the sharing of “best in class” tools and the experience and expertise of others. Today, over 100 organizations representing over 3000 clinical research professionals, from over 200 sites and across numerous therapeutic disciplines have joined N2’s initiative. Members include organizations as varied as research networks, universities, hospitals, government entities and industry. The breadth of N2’s member organizations and the depth of their collective experience have enabled N2 to become an important voice in the national clinical research debate. For more information please visit n2canada.ca. The Ottawa Regional Cancer Foundation is the voice for cancer survivorship in Eastern Ontario. The Cancer Foundation is a leader in our community in providing local residents with increased access to personal cancer care through the delivery of the Cancer Coaching Health and Social Care Service, innovative cancer research and a world-class clinical trials program. For more information please visit www.ottawacancer.ca.